A year Older Today. I am a lot wiser than yester year. Do I even know what that means? I do not. Because deep within is a child that wants to grow, a woman that wants to truly express herself and a star that wants to shine-but all for the right reason. Mediocrity has never worked for me: Lies always stare back at me in the face, I can’t take them. Truth is hard to tell and live by, but over the years I have learned: it is wiser and better to live by it. It lasts longer. · Life is full of unpredictable experiences and events. They seem like stones dropped into the gears of ingenuity. · The world would like to change me: there are pressures all around. But I ought to decide who I am and firmly hold my ground. · There is too much to learn: But all new things aren’t good. Wisdom lies in what I have learned and what have withstood. · To be myself is a choice I make. I must not allow the world to take control. Preserving my identity is Life’s most precious goal. · There will be times when the world feels large and meaningless. [I get those too]. 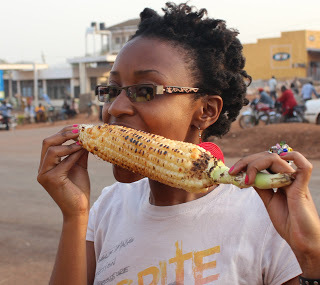 I choose to focus on little things…sunlight through the leaves, the taste of a Rolex [Ugandan Made] and or roasted maize, the buzz of a bee- little comforts is what I call them. They are the friendly and familiar things. · This too will pass… when things are dreadful, when life is absolutely appalling, when everything is superb and wonderful, when all is marvellous and happy: those four words always give me a sense of perspective. · No matter the mistakes I make, I can never usurp the calendar of events God has planned. · When one door closes, another opens. Every time I expect the new door to reveal greater wonders, glories and surprises. I feel myself grow with every experience. ·Something is not always better than nothing, In most cases: nothing offers more PEACE of mind and fewer battle scars. · If it is your time, Love will track you down like a cruise missile. Those are just a few bits and pieces that I just pulled out of my high school journal. It has been an amazing journey. The more I look back, the more I am inclined to trust God even more. I want to end today with a twist; this is a poem that I fell in love with as a literature student in high school. Then it made sense and today it even makes more sense. I am not lamenting. These past few years, have been quite an experience that I am grateful for. I wouldn’t trade it for anything. But it is a cry for innocence. I am sure we all at one time want to go back to that place. It is by a Nigerian Poet; Gabriel Okara. My prayer for the new year; I pray not for an easier Life; I pray to be a STRONGER person. I pray not for tasks equal to my power: I pray for power equal to my tasks. Beautiful poem, I agree. Whooah!! May God give you the desires of your heart. Happy one. The poem is one of those… Amen! 🙂 Thank you for being an audience! Happy Birthday girl. I really like how you write. Thank you; I hope that I can keep you as a reader. Happy Birthday Ruth…Yo pieces are always inspiring: Way to go Gal!! And thank you for always reading! I looove the second pic…and definitely love your words of wisdom. Awesome. So you finally, got to read. Thank you for stopping by.